Built in an area of about 170 sq ft, these are equipped with air-cooling systems and are powered by solar energy. 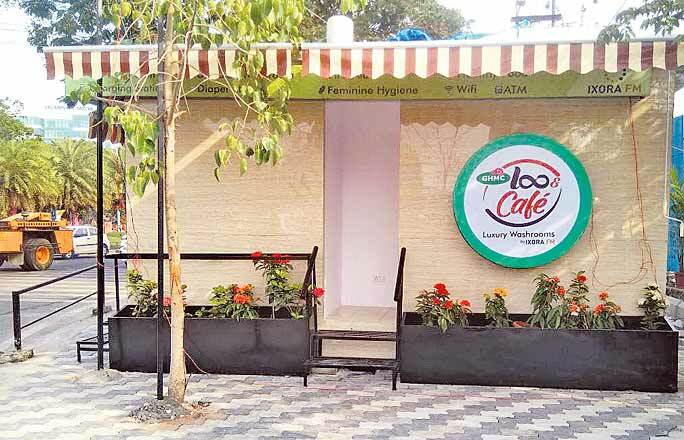 Hyderabad: Greater Hyderabad Municipal Corporation (GHMC) is coming up with a Loo&Cafe concept, which will have luxury washrooms equipped with Wi-Fi, ATMs, diaper stations, coffee vending machines and other facilities. The first Loo&Cafe is constructed opposite Shilparamam, Madhapur. Apart from providing a host of facilities, these luxury washrooms are designed to cater to the requirement of physically challenged, women and other commuters. Built in an area of about 170 square feet, the washrooms are equipped with air-cooling systems, besides insect repellent and are powered by solar energy. They also have live podcasts and a dedicated radio channel on hygiene and Swachh Telangana. Meanwhile, Municipal Administration and Urban Development Minister KT Rama Rao will inaugurate the GHMC’s AC bus shelter at Shilparamam on Tuesday. is constructing 826 bus shelters equipped with toilets, mobile charging units, drinking water facilities, Wi-Fi, ATM, coffee vending machines and other features across the city. They are being constructed in four packages in association with private agencies under design, build, finance, operate and transfer mode. The grade one package bus shelters are being constructed at Khairtabad RTA, Kukatpally Housing Board Colony, Kukatpally and opposite Shilparamam, Hitec City. GHMC Commissioner B Janardhan Reddy along with Zonal Commissioner D Harichandana inspected the bus shelter at Shilparamam on Monday. In addition to these, the Minister will inaugurate Hyderabad Metropolitan Water Supply and Sewerage Board reservoirs at Madhapur, Lingampally, Hydernagar and other areas on Tuesday.